The forage crops are species with fast growing (max 1 year) and with the target of green forage, hay and silage production, for animal feeding. 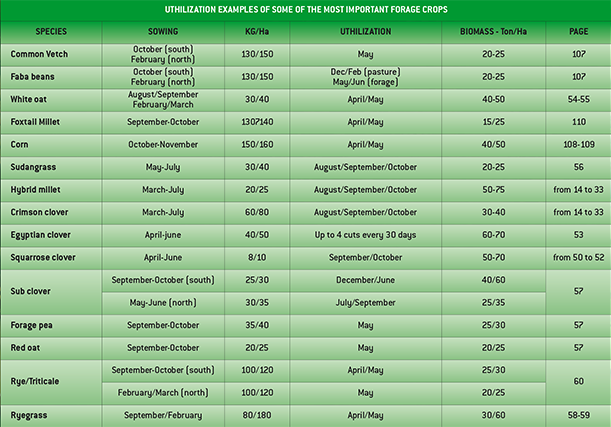 The forage crops, single species or mix, are composed by forage species that can consent the forage integration of the farm and normally are interpose crops, because they occupy the soil in the period between two principal crops. Depending from the growing season, we can divide the forage crops in four different sectors: spring forage crops, summer forage crops, autumn forage crops and winter forage crops. In central and south Italy, forage grasses is used as a main autumn/spring cycle crop (e.g. clover, vetch). In north Italy it is mainly used as a spring/summer cycle intercrop (e.g. : corn, sorghum, Italian millet). In recent years, this crop has been "rediscovered" for purposes other than direct production, for green manure (particularly in organic farming), and as a "cover-crop" to prevent soil erosion and nitrate leaching.